How would you characterize a good film? What is the most important thing about a film festival? To let the audience encounter different worlds through movies and to let moviemakers know each other and widen their perspectives. What do you think you’ll do ten years from now? Cook or shoot a movie. With only one screening, sold-out, at the 25th Santa Barbara International Film Festival (February 4-14, 2010), word is out: I Am Love (2009) is a feast for the senses. Yet a big part of what Italian writer-director-producer Luca Guadagnino serves up is food for thought, which makes the devouring all the richer. Lest there be doubt, his first feature lays his turf. In The Protagonists (1999), British film star Tilda Swinton takes a film crew to London’s West End to research the topography of a crime: a British citizen of Egyptian origin was murdered by two seemingly innocuous students. Upon reconstructing the series of events in minute detail through interviews with the perpetrators, their colleagues, the victim’s family, even the judge, Swinton and her crew act out first the court procedure and then, as information accumulates, the parts of the murderers and the victim. Ultimately Swinton addresses the salient question in a vérité sequence at the scene of the crime: to film means to make a picture of oneself; to be filmed means to embody. What can we see when we make a picture for ourselves? It’s the issue raised for reflection by Luca Guadagnino throughout his oeuvre since then. What is also worth recalling is that this was his feature film debut, presented in competition at the International Film Festival Mannheim-Heidelberg, and while I was watching it there he was probably in the next-door theater looking at Rebecca, Suspicion, or North by Northwest in the Hitchcock sidebar, noting the increasing ennui of a young blond wife in an aristocratic manor, or the images that melt into signs in the psyche, or the enigmas of a hilltop chase scene. After his Q & A, Guadagnino rounded up a group of us for a spontaneous supper in Mannheim’s Turkish community where food is served late, suiting the night-time cinema gluttons that fest-goers tend to be. The air was filled with the aroma of grilled vegetables and heady talk of the screen. 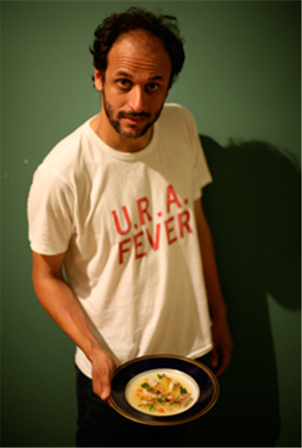 Two facts became clear: Luca appreciated the role of food and he was smitten with Tilda Swinton. Once in a blue moon, an encounter on the screen carries you away to a place with a longer, wider, clearer view. You are caught there, though you entered freely. I Am Love is that cinematic experience. With a highly informed sensibility and impeccable taste, Luca Guadagnino lights a quiet fire on the screen. Guadignino is of the philosophical and aesthetic cognoscenti, and he is clearly committed to tackling the sexual and social politics of our day. Yet to do so with such supreme elegance is a rare feat. With unfaltering verve yet utmost control, he radiates infectious energy in his flawless new gem, I Am Love. Bearing the moral compass of Rossellini, the grace and gravitas of Visconti, the high style of Hitchcock and the themes of Sirk in a voice that is boldly inventive and assuredly his own, Luca Guadagnino has arrived, and he is a gift to cinema. Milano in winter: its stately old towers and façades beside new construction sites while the snow falls silently. For the most part I Am Love transpires between this pristine setting and a summery Sanremo that is a gateway to flowering fields. These two spaces — the Art Deco villa of a textile industrialist with his haute-bourgeois family at Christmas and the sunny hillside cottage with vegetable gardens worked by a peasant chef — are the terrains to be traversed in subtle, uncanny ways at first but ultimately with bold and decisive strides as sea changes overtake the characters in an operatic drama of irrevocable upheaval. Through it all, what astonishes is the facility with which Guadagnino plays on opposing palettes, taut and restrained, lush and impassioned. He is adroit at both, and he deftly orchestrates them into one opus with precision and finesse yet always an intuitive élan vital. We become acquainted with the Recchi family through their parties, the rituals so emblematic of their class. The matron, Emma (Tilda Swinton), nods for the servant, Ida (Maria Paiato), with reserved decorum at the long table where polite exchanges are uttered at elaborate place settings. It’s the beginning of the new millennium, and the fashion is the clean lines and urbane simplicity displayed in Fendi and Jil Sander suits, coats, and dresses. But there are significant lacunae in the social fabric of this family. Tancredi (Pippo Delbono) faces the first of these, as the legitimate successor to his father, Edoardo, Sr. (Gabriele Ferzetti): the elderly paterfamilias, celebrating his last birthday, has an eye for his grandson, Edoardo, Jr. (“Edo,” Flavio Parenti) as his scion and toasts the young man with all too much admiration at the family table as he proclaims a joint entitlement for Edo and Tancredi. When Tancredi makes a decision to sell off the family enterprise, another son, Gianluca, is a contented bystander while Edo, the new co-heir, is upset by his father’s financial move that lacks the noblesse oblige of the family tradition regarding treatment of the factory workers. Yet Edo, who was always closer to his mother, remains effete in challenging the nexus of power, being either weak-kneed or simply distracted. His balking participation plays out in two ways — his pro forma engagement to an ill-chosen fiancée and his consuming mission to appeal to another father, that of his friend Antonio (Edoardo Gabbriellini), to grant the land Antonio needs for growing a garden and opening a rustic restaurant where he will cook and Edo will conduct the business. The peasant Antonio is of another breed, his feet on the ground (his bare toes literally dug into the soil of his vegetable patch) and his heart off at a gallop, at least once Edo’s mother, Emma, agrees to dine at the restaurant where he currently cooks. How she has relished Antonio in her kitchen, gently heating individual canopies with his salamander, the technique of the torch much to her fascination, as he prepared the cuisine for Edo’s engagement party. Now Emma heads for Nice to meet her daughter, Elisabetta (Alba Rohrwacher), an artist studying abroad who will show her work in a gallery there. 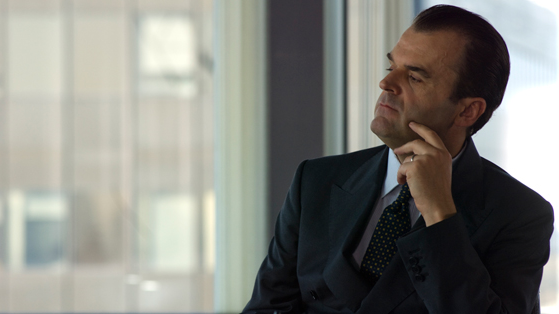 Elisabetta has sent a note to Edo confiding in him a secret and Emma unintentionally intercepts it. Then it’s just as unconsciously that a fateful chain of interactions is set off, unraveling every thread that once held this family together in its gossamer web of loyalties girded with name, wealth, and power. Swinton has commented that it was no daunting task to learn a new language for the film — so that she could play her entire role in Italian — but it’s quite another matter to master a Russian-accented Italian. It’s a reminder that her character, Emma (a new name her husband gave her when he transplanted her to Italy from her native Russia), was expected to foreclose on any identity of her own once she married the Milano textile magnate who, in sound patriarchal authority, used his lineage to hold the reins on his family and his factories alike. Yet, when the question of selling the business under the imperatives of a failing economy arises, the workers are quite disposable; by contrast, Emma should remain a more visible trophy than ever before in the Recchi dynasty. Emma’s radiance fills the pastoral screen far more than it does the family villa: the frames are saturated with golden splendor in a particular montage of close-ups in which insects all but dance among abstractions of naked flesh. The sequence is set to an effervescent score by John Adams that is one of the most creative choices in conceiving this film. Throughout the narrative, the music (including segments from Adams’ operas) is an ingenious pairing with the film’s premise as the minimal, lithe score runs brightly counter to the requisite order of the Recchi estate. Yorick Saux’s photography is superbly refined throughout, presenting architecture (for example La Chiesa Russa in Sanremo, which Emma visits with reverie) that lends itself to the graphic design of shots as unforgettable as the coiled coiffure that hugs the nape of Swinton’s neck as the camera follows her in a pursuit she can’t explain even to herself. Historic blonds come readily to mind — Hitchcock’s Grace Kelly and Kim Novak, and later in the film, Rossellini’s Ingrid Bergman — but their repression, their mystique, their classical allure that so stunningly hangs in the wings of this film gives way to Swinton’s own self-possession as the icon of a new era in cinema. As for Guadagnino, the challenge is also a new one, and one inherent in his coming of age as an artist and a social thinker. Born in Palermo, he grew up in Ethiopa with a Sicilian father and an Algerian mother. Then he earned his university degree at “La Sapienza” in Rome where he has, since then, worked in theatre, cinema, and digital media while writing essays as well. Ironically, Guadagnino discusses the title of his film, I Am Love, in the context of war. He notes that contemporary philosopher Slavoj Žižek ends his book, Iraq: the Borrowed Kettle by citing Martin Luther’s thesis that real love is finding the sublime in the cross of everyday vulgar life. Put another way, says Guadagnino, this time paraphrasing Alain Badiou, real love is the way you allow the difference in the Other. “This movie is about people struggling to deny their own feelings and to deny the Other, for different reasons, mostly for capitalistic ones,” he explained to Cineuropa. Director: Luca Guadagnino; Producers: Luca Guadagnino, Tilda Swinton, Alessandro Ussai, Francesco Melzi D’Eril, Marco Morabito, Massimiliano Violante; Story: Luca Guadagnino; Screenplay: Barbara Alberti, Ivan Cotroneo, Walter Fasano, Luca Guadagnino; Cinematographer: Yorick Le Saux; Editor: Walter Fasano; Production Designer: Francesca Di Mottola; Composer: John Adams; Costume Designer: Antonella Cannarozzi with Jil Sander and Fendi. Cast: Tilda Swinton. 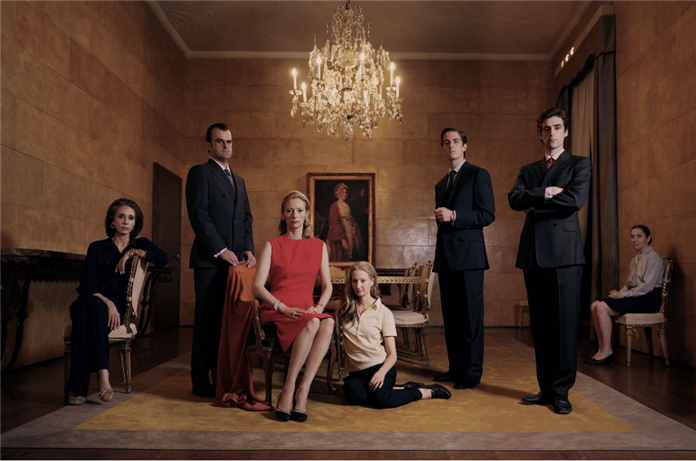 Flavio Parenti, Edoardo Gabbriellini, Alba Rohrwacher, Pippo Delbono, Maria Paiato, Diane Fleri, Waris Ahluwalia, Gabriele Ferzetti, Marisa Berenson. Color, 35mm, 120 minutes. In Italian, Russian, and English with English subtitles.